The world around me is a wonderful visual stimulus through which I explore the process of abstraction based on the visual reality in front of me and the interaction of that view, the medium at hand, and my skills. That I can look at the reality in front of me, see it realistically, and yet ‘create’ other possible abstracted versions from that reality, is very exciting and a wonderful creative impulse. The past number of years I have concentrated in several mediums: Clay is a wonderful plastic and immediate medium. My current clay sculptures are images based on travels in the Dolomites, among other places. 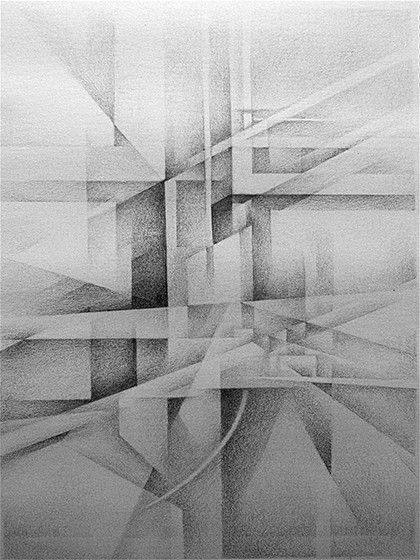 Graphite tonal drawings offer me a unique way to explore the process of abstraction and, in part, creating ‘overlapping layers’ and the illusion of 3D depth on a 2D surface. The camera allows me to capture an ephemeral circumstance and/or momentary visual image. My personal vision is attracted to unusual ‘slices’ of reality that are what I see in the view finder, but when cropped or a section isolated, become ‘abstract’ and present another visual ‘reality.’ Each piece, regardless of medium, is a journey from one reality to another, both connected, yet separate and distinct.